I love hamburgers. Actually, I should specify, I love cheeseburgers. Yum. So, imagine my delight when I received an email informing me that this Friday is National Hamburger Day - 5/28. If you didn't get a chance to try the Radius burger for half off last month (here), first of all - shame on you. Secondly, here's a few other options that will be available for National Hamburger Day. Fleming’s succulent “Prime Burger Bar” menu comes fivefold. Choose from Fleming’s Prime Burger (cheddar cheese, peppered bacon - $12; $6 before 7pm nightly); Sliced Filet Mignon Burger (sautéed mushrooms, Béarnaise sauce - $18); Jumbo Lump Crab Cake Burger (creamy mustard sauce - $16); Ahi Tuna Burger (soy ginger sauce - $12); and, Portobello Mushroom Burger (sautéed spinach, creamy goat cheese - $10). All Fleming’s Prime Steakhouse & Wine Bar’s options come with signature onion rings. The chefs at Legal Sea Foods are cooking up an ‘al-tuna-tive’ for fish lovers to join in the celebration: a succulent tuna burger that appeals to both carnivores and pescatarians alike. The Tuna Burger, one of their most popular lunch items, is made from ground yellowfin tuna with chili sauce and a crumb mixture of oyster crackers and spices. It’s grilled and then served on a buttery brioche bun with roasted red pepper mayo, ($13.95). Legal Sea Foods also serves up a Niman Ranch Burger, 10 oz. hand packed all natural beef ($10.95). For burger lovers, Chef Southern packs five different options for $10-and-under: Iron Pan Burger (eight ounce house recipe beef burger, red wine glaze, leaf lettuce, beefsteak tomato, house made relish, Tribecca oven Challah roll - $9); Misty Knoll Tuscan Style Chicken Burger (grilled chicken breast, Tuscan bread, prosciutto, roasted red pepper, Manchego-basil pesto, fresh farmers cheese - $9); Double Portobello Manchego Burger (two extra large Portobello mushrooms layered with Manchego cheese, sweet tomato relish, Tribecca over Challah Roll - $10); Lamb Burger (eight ounce lamb burger iron pan style, arugula, house made relish, goat cheese, Tribecca over Challah roll - $10); and, Sage Cheddar Burger (iron pan burger topped with sage cheddar and caramelized onion - $10). Executive Chef Mark Cina’s burger at Stoddard’s Fine Food & Ale is quickly becoming a crowd favorite. The Stoddard’s Burger packs all natural Meyer Ranchbeef and is topped with aged cheddar, chiffonade lettuce, signature Stoddard's burger sauce, fresh onion and B&B pickles ($14). It is served with your choice of house fries or beer-battered onion rings. Anyone know if there is a National Cream Cheese Danish Day? Because that would be awesome. PS. 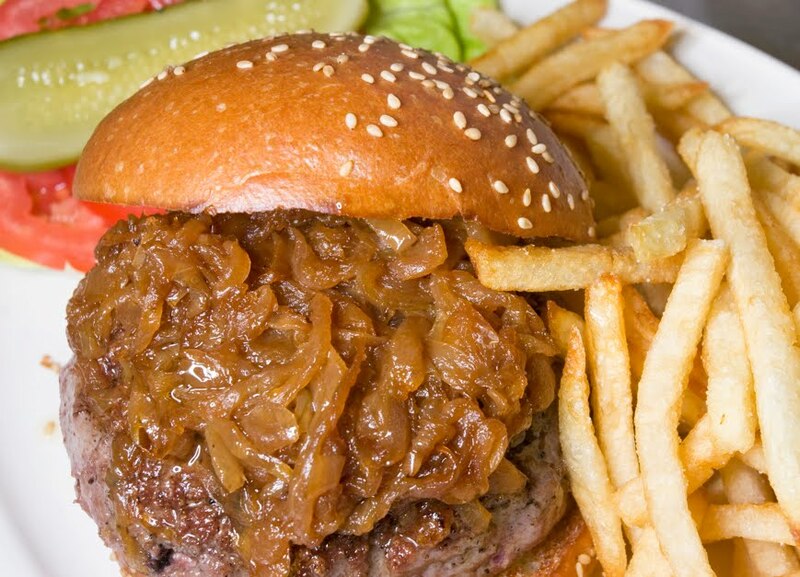 The image above is the Black Label Burger at Minetta Tavern in NYC. I almost cried when I ate it; it was THAT delicious. 0 Response to "National Hamburger Day - 5/28"